What Are Benchmarks, Baselines, Targets And Standards? In performance improvement, a few important terms are often confused or misused. So, exactly what are benchmarks, baselines, targets and standards? An area of confusion that comes up regularly in my workshops and consulting is the array of words we use to describe two very simple statements about performance: current performance and desired performance. People use them interchangably, and often can’t provide a definitive definition for each to discern one from another. It’s important to do that discerning and prevent time-wasting debates and misinterpretation that get in the way of performance improvement. The definition of ‘baseline’ is provided by Dictionary.com as: A minimum or starting point used for comparisons. A baseline for your performance measure is the average level of performance that you are currently at, and that you will compare future performance levels with to test if performance is really changing. In an XmR chart, your baseline is the Central Line. A single value of your performance measure is not enough to act as your baseline, because you’ll end up mistaking the routine variation in your measure for change. Noun: A standard or point of reference against which things may be compared or assessed. Verb: Evaluate or check (something) by comparison with a standard: “we are benchmarking our performance against external criteria”. 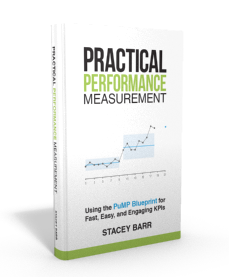 Benchmarks in performance measurement typically come from outside your organisation. They are levels of performance that another organisation has achieved for that same performance measure you’re interested in. Benchmarks from organisations that represent world’s best practice or industry best practice can become targets that you use for your performance measures. 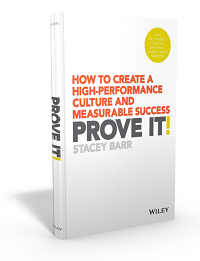 Because others have achieved that level of performance, it’s easier to conceive that you can too. What is a performance target? A target is defined as (from Dictionary.com): A person, object, or place selected as the aim of an attack. I’m not super-keen on using the word ‘attack’, so I would adapt this to define a performance target as a level of performance we are aiming to reach in the future. In the future is an important qualifier. To shift a baseline performance level to a targeted performance level takes time and effort to redesign the underlying business processes so they are capable of better performance. If you tell everyone to work harder to ‘hit target’ every month, you’re just compensating for a process that isn’t capable and it will burn everyone out before too long. For example, when we make a promise to our customers to fix their problem within 2 days 95% of the time, the standard for our performance measure becomes 2 days. It means that we want to see our performance measure’s values for Days to Fix Problems to be under 2 days in at least 95% of cases. Just because you have a standard doesn’t mean your business processes are capable of meeting it! Part of performance improvement is to design our processes to make them capable of meeting any standards. Standards are similar to targets, but they apply ‘here and now’: you’ve made a promise to your customers and you want to monitor how well you’re keeping that promise. Do you use these terms in your organisation or business? Collaborate with me on the Measure Up blog by sharing examples of how you’re using baselines, benchmarks, targets and standards. Many Thanks for the explanation. These words are so often interchangeably used that leaves so many targets set for many individuals. Is there any merit in viewing the context of these words as individual, group and organisational ? For example a standards or benchmarks could be a collective effort while targets can be individual and collective. I am seeking this to understand where the ownership of the achievement of these should lie. While executing it would help to understand where I my accountability is personal and where is it as a team. This will in turn trigger corrective measures at an individual level or a group level. TN, I would use the same definitions of these terms no matter who was using the performance measure, or what the performance measure was for. I don’t subscribe to the idea of individual people having performance targets – there is too much overwhelming evidence that collaborative team-based performance measures and targets (or standards or benchmarks) are much more likely to grow organisational success, and individual targets are much more likely to undermine organisational success. Thank you. I subscribe to your thinking. I was even involved in making this work for a farming project where 10-15 farmers collectively are responsible for their yield or lack of it in their respective ‘joint liability groups’… What it did to the farmers was they learnt from each other and pushed their productivity up. I find this is not being adopted in the corporate world where team targets are rare and it is only a summation of the individual targets. T N, your story is just so relevant to me right now! This area of how individual targets drive behaviour AGAINST organisational goals really needs some rigorous debate that is informed by evidence-based research. We don’t need more hearsay on this topic – it’s doing too much damage to not try and change it now. I’ve started a discussion on the Measure Up LinkedIn group (http://www.linkedin.com/groups/Measure-Up-4419275?gid=4419275) to try and get a list of known research into this topic of measuring people and using individual targets to manage and reward performance. I love your definitions. They’re pretty much the same as I use for Baseline and Benchmark – Baseline is my starting point, Benchmarks are when I want to compare to others (preferably a standard : – ). Standards is where my definition deviates a little. The premise is the same, but for me standards are industry-established or industry-affirmed values. Standards are something I think our industry (performance measurement) lacks. We don’t have standard definitions for things like “benchmarks, baselines, and targets.” It makes it very difficult to have meaningful discussions if our language lacks standardization. This same type of standardization would be applied to measures we want to compare. So when you say “turnover” we define them the same way. Lastly is the term “targets.” Recently I positted a very radical approach of no longer using targets. 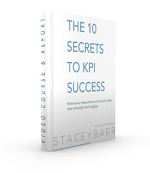 The reasons are simple – they fit your explanation of why we shouldn’t have individual performance targets. My exception? if we set those targets ourselves, for ourselves – in which case I would not call it a target any longer – but a goal. Basically for me targets are “set” by others as a requirement for me. The major problem though isn’t just who sets the target – it’s that we end up chasing the number (target) and lose sight of the underlying purpose/goal behind that number. In most cases the numbers we end up chasing were meant to be an indicator of progress or success. When we set a “target” we end up making that indicator more important than the goal it was supposed to be providing insight to. Thanks Marty. Just finished reading your book, by the way, so I know what you mean by your thoughts about targets. I’d suggest the word target doesn’t have just that one meaning of a target being set by someone else as a requirement. That’s a way of using targets, and I agree with you that it’s not a constructive way to use targets. To me, a goal is a measure + target + timeline, all expressed in a single statement. You’re sooooo right about the terminology challenge we face in our field. I have no solution to that! But I recommend we all do as you do so well Marty, and that’s define our meaning of the words we use. I’m currently creating an overview of all the peformance measurments and standards we use because many people have lost the overview (The fact that I’m doing this indicates there is a lot of improving to do). While doing this I found that we have a several best practice templates in which is described what and how certain things need to be described. For instance a template for a Project Specification. By having such template we basically say that if all information is filled in according to the template, we fullfill a certain quality or performance. So is it fair to say that Performance Standards are not only figures, but can also be document templates or descriptions of expected quality? I like to know your view on this. Andre, if I’ve understood you correctly, then I’d agree. In PuMP (my measurement methodology) every step has a template that makes sure the thinking about each stage of designing, defining, reporting, and using a measure is documented clearly. We can easily make the wrong assumptions by looking at the numbers only. Please send me metrics for performance benchmark standard for industrial company, thanks.. More power.